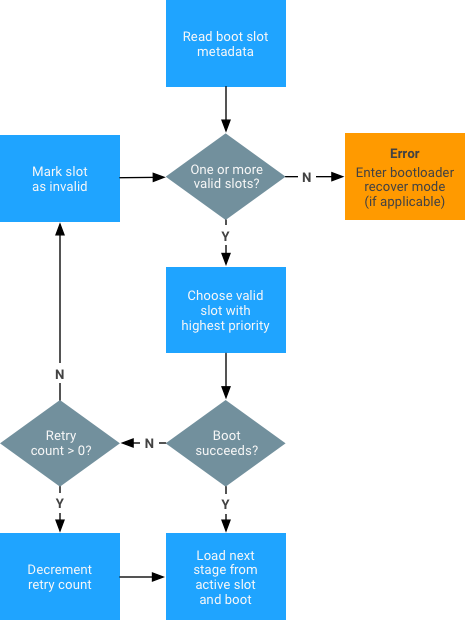 OEMs and SoC vendors who want to implement A/B system updates must ensure their bootloader implements the boot_control HAL and passes the correct parameters to the kernel. A/B-capable bootloaders must implement the boot_control HAL at hardware/libhardware/include/hardware/boot_control.h. You can test implementations using the system/extras/bootctl utility and system/extras/tests/bootloader/. If booting without ramdisk and using "boot as recovery", cherrypick android-review.googlesource.com/#/c/158491/. To set up dm-verity without ramdisk, cherrypick android-review.googlesource.com/#/q/status:merged+project:kernel/common+branch:android-3.18+topic:A_B_Changes_3.18. skip_initramfs rootwait ro init=/init root="/dev/dm-0 dm=system none ro,0 1 android-verity <public-key-id> <path-to-system-partition>"
... where the <public-key-id> value is the ID of the public key used to verify the verity table signature (for details, see dm-verity). Successful inclusion of the .X509 certificate indicates the presence of the public key in the system keyring (highlight denotes the public key ID). Replace the space with # and pass it as <public-key-id> in the kernel command line. For example, pass Android:#7e4333f9bba00adfe0ede979e28ed1920492b40f in place of <public-key-id>. For an example, refer to /device/google/marlin/+/android-7.1.0_r1/device-common.mk. You can optionally conduct the post-install (but pre-reboot) dex2oat step described in Compiling. A/B devices do not need a recovery partition or cache partition because Android no longer uses these partitions. The data partition is now used for the downloaded OTA package, and the recovery image code is on the boot partition. All partitions that are A/B-ed should be named as follows (slots are always named a, b, etc. ): boot_a, boot_b, system_a, system_b, vendor_a, vendor_b. For non-A/B updates, the cache partition was used to store downloaded OTA packages and to stash blocks temporarily while applying updates. There was never a good way to size the cache partition: how large it needed to be depended on what updates you wanted to apply. The worst case would be a cache partition as large as the system image. With A/B updates there's no need to stash blocks (because you're always writing to a partition that isn't currently used) and with streaming A/B there's no need to download the whole OTA package before applying it. The recovery RAM disk is now contained in the boot.img file. When going into recovery, the bootloader cannot put the skip_initramfs option on the kernel command line. For non-A/B updates, the recovery partition contains the code used to apply updates. A/B updates are applied by update_engine running in the regular booted system image. There is still a recovery mode used to implement factory data reset and sideloading of update packages (which is where the name "recovery" came from). The code and data for recovery mode is stored in the regular boot partition in a ramdisk; to boot into the system image, the bootloader tells the kernel to skip the ramdisk (otherwise the device boots into recovery mode. Recovery mode is small (and much of it was already on the boot partition), so the boot partition doesn't increase in size. No partition should be named vendor. Instead, partition vendor_a or vendor_b will be selected and mounted on the /vendor mount point. The current slot suffix should be passed either through a specific device tree (DT) node (/firmware/android/slot_suffix) or through the androidboot.slot_suffix command line argument. --slot SLOT. Override the default behavior and prompt fastboot to flash the slot that is passed in as an argument. --set-active [SLOT]. Set the slot as active. If no optional argument is specified, then the current slot is set as active. fastboot --help. Get details on commands. has-slot:<partition-base-name-without-suffix>. Returns “yes” if the given partition supports slots, “no” otherwise. current-slot. Returns the slot suffix that will be booted from next. slot-count. Returns an integer representing the number of available slots. Currently, two slots are supported so this value is 2.
slot-successful:<slot-suffix>. Returns "yes" if the given slot has been marked as successfully booting, "no" otherwise. slot-unbootable:<slot-suffix>. Returns “yes” if the given slot is marked as unbootable, "no" otherwise. slot-retry-count. Number of retries remaining to attempt to boot the given slot. To view all variables, run fastboot getvar all. The OTA package tools follow the same commands as the commands for non-A/B devices. The target_files.zip file must be generated by defining the build variables for the A/B target. The OTA package tools automatically identify and generate packages in the format for the A/B updater. The update_engine can update any pair of A/B partitions defined in the same disk. A pair of partitions has a common prefix (such as system or boot) and per-slot suffix (such as _a). The list of partitions for which the payload generator defines an update is configured by the AB_OTA_PARTITIONS make variable. All partitions updated by update_engine must not be modified by the rest of the system. During incremental or delta updates, the binary data from the current slot is used to generate the data in the new slot. Any modification may cause the new slot data to fail verification during the update process, and therefore fail the update. You can configure the post-install step differently for each updated partition using a set of key-value pairs. To run a program located at /system/usr/bin/postinst in a new image, specify the path relative to the root of the filesystem in the system partition. For security reasons, system_server cannot use just-in-time (JIT) compilation. This means you must compile ahead of time odex files for system_server and its dependencies at a minimum; anything else is optional. Include the native components in the build to ensure compilation script and binaries are compiled and included in the system image. Connect the compilation script to update_engine such that runs as a post-install step. For help installing the preopted files in the unused second system partition, refer to First boot installation of DEX_PREOPT files.